**If you're looking for NTT, it is happening now, right HERE. 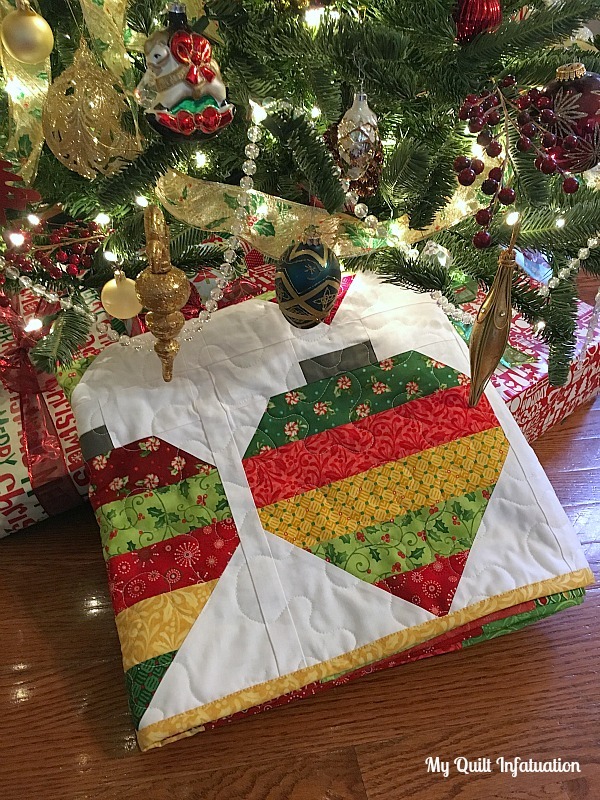 But before you go check out the party (and another new quilt top I shared), take a look at this fun Christmas quilt tutorial and enter the giveaway below! After several days of keeping it secret (and I'm terrible at that), I am so glad I finally get to share this fun Christmas ornament quilt with you! 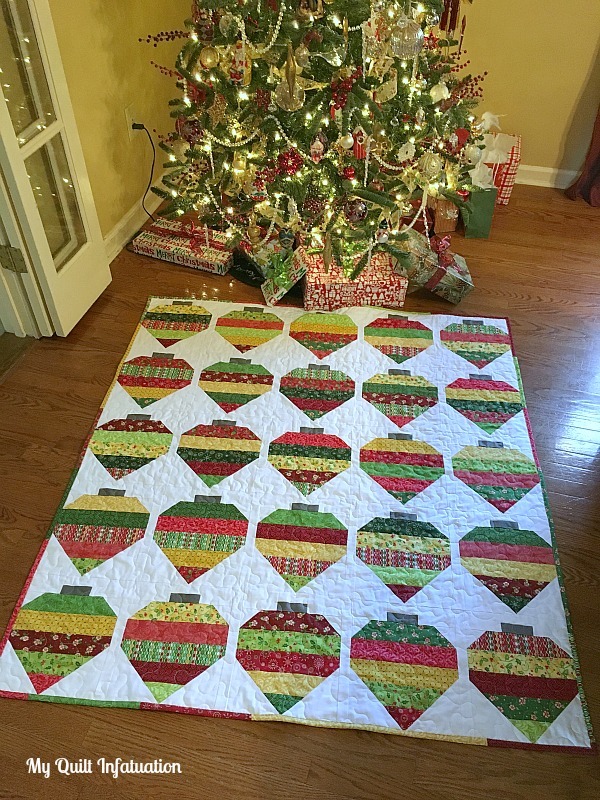 The quilt is made with the Santa's Here line from Benartex, and it was so much fun to create! I wanted to create a quilts that would show off several of the prints in this line, and I wanted the quilt to be a little bit whimsical. If you can't have a bit of whimsy at Christmas, then when can you have it? I love the rich colors in this collection, as well as the fact that the prints have traditional motifs without looking cartoonish. I included so many more prints than necessary on the front of this quilt, which gave me lots of leftovers for the backing, and even a scrappy binding! I couldn't resist taking the photos of this one under my Christmas tree. It can't possibly serve it's quilty purpose rolled up under the tree of course, but doesn't it look right at home? I have created a full tutorial for this quilt, including fabric requirements and cutting diagrams (and it's pretty quick to put together! 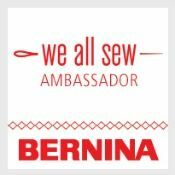 ), so head on over to the Benartex blog, Sew in Love With Fabric to check it out! The kind folks at Benartex are giving away a fat quarter bundle of the beautiful Santa's Here fabric collection. To enter the giveaway, become a follower of Sew in Love With Fabric by email or blog reader. You can find the buttons for those on their right sidebar. Then, just leave a comment for me here to let me know how you're following. If you are a follower of My Quilt Infatuation as well, you get a second entry! For your second entry, leave a second comment with your favorite Christmas song (only two entries per person, please). The giveaway will close one week from today, on 12/17. Best of luck to all! This giveaway has now ended. Thanks so much to all who entered, and Merry Christmas! Beautiful quilt! I follow Sew In Love With Fabric by email. 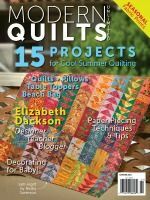 Beautiful quilt and wonderful tutorial. I follow Sew In Love Fabric via GFC. I'm now following Sew In Love with Fabric through Bloglovin. Your ornament block is adorable. Thanks for sharing. O Holy Night is my favourite. I follow Sew in Love with Bloglovin. I follow you on Bloglovin-favorite Christmas song is White Christmas. Your quilt is gorgeous! Great use of colors. i follow sew in love on bloglovin'. I follow Sew in Love on their newsletter now. Thanks! I follow SILWF via Bloglovin. I follow you via Bloglovin. Thanks for the great tutorial and giveaway! I follow Sew in Love with bloglovin'. My favorite song is Away in a Manger. Kelly, your quilt is so pretty.I really love all the colors and the design. I follow Sew in Love with Fabric on Bloglovin. I follow you on Bloglovin. And my favorite song is Mary, did you know? 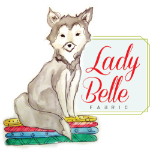 FOLLOW SEW IN LOVE WITH FABRIC ON BLOG LOVIN'! THANK YOU FOR A PRETTY GIVEAWAY! Favorite Christmas song is Burl Ives singing Holly Jolly Christmas - immediately puts me in the Christmas spirit! And the quilt is lovely! 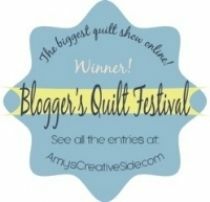 I am a faithful follower via bloglovin - great job on the quilt tutorial. I follow Sew In Love with Fabric via GFC. I follow your blog by email. Love the Little Drummer Boy done by David Bowie and Bing Crosby. My favorite Christmas song is the Little Drummer Boy. I love your quilt and I also like the idea of making a table runner out of this block. Thanks for the great tutorial and giveaway. I follow via email and enjoy their posts. I love Once in Royal David's City. I am a follower of Sew in Love with fabric via bloglovin'. I am a follower of your blog via bloglovin' too! My favourite song is Hark the Herold angels sing! I am now a follower of Sew in Love With Fabric via bloglovin. I follow your wonderful blog. My favorite xmas song is Rocking Around the Christmas Tree. I follow your blog and my favorite Christmas Song is It's the most wonderful time of the year! I really love your quilt. I don't remember seeing one like that before. Really like it. Great tutorial. I am already a follower of your blog as well. I follow Sew in Love With Fabric via e-mail. Already a follower of Sew in Love with Fabric via email (different one to this one). I follow you through Bloglovin'. My favorite Christmas song is Happy Christmas. Signed up to receive your emails. Fabulous quilt - will make one for next Christmas. O Holy Night is a favourite Christmas song. That quilt looks fabulous, thank you for the tutorial. Thank you for the giveaway! Beautiful quilt. I love the ornament quilts. I follow by email. I follow by email. My song is white Christmas. Bernartex's Santa's Here line is GORGEOUS!! love it & your pattern! I am following your blog via email and Blogger. My all-time favorite Christmas song is White Christmas . . . sung by Bing of course! follow Sew in Love (with Fabric) via their blog and email. I follow you via Bloglovin as well... I love O Holy Night! I follow your blog w/ Bloglovin! I follow you through Feedly. And there is just nothing like hearing Silent Night at the end of the candlelight service. All the hurry and fuss of the Christmas season falls away and it becomes Christmas in the right spirit for me. 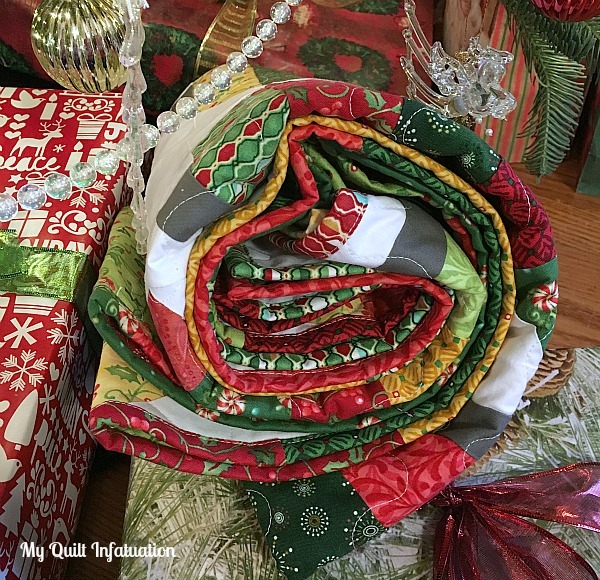 My quilt infatuation - I also follow w/ bloglovin! I follow Sew In Love with Fabric via email! I follow you thru email. My favorite sontg is Little Drummer Boy! I follow Sew In Love via Bloglovin. My favorite Christmas song is We Three Kings! I love your Christmas quilt. It's my favorite Christmas one I've seen this year. Beautiful! I'm a follower of Sew in Love With Fabric with Bloglovin'. Thanks for the great tutorial & the chance to win. I'm also a follower of your blog, via Bloglovin'. My favorite Christmas song is Mary Did You Know. Thanks again. Love this block!! Would like to make a table runner using it. :) I am a follower via e-mail. I follow Sew In Love by email. Great design. I follow Sew in Love With Fabric with email and GFC. I already follow Sew in Love with Fabric via email notice. Thanks for this tutorial. I believe I will make this, hopefully soon! I also follow you too, via bloglovin. My favorite Christmas song? Hmmm . . . that would have to be Silent Night. I follow SiLwF by email and signed up to follow you too! 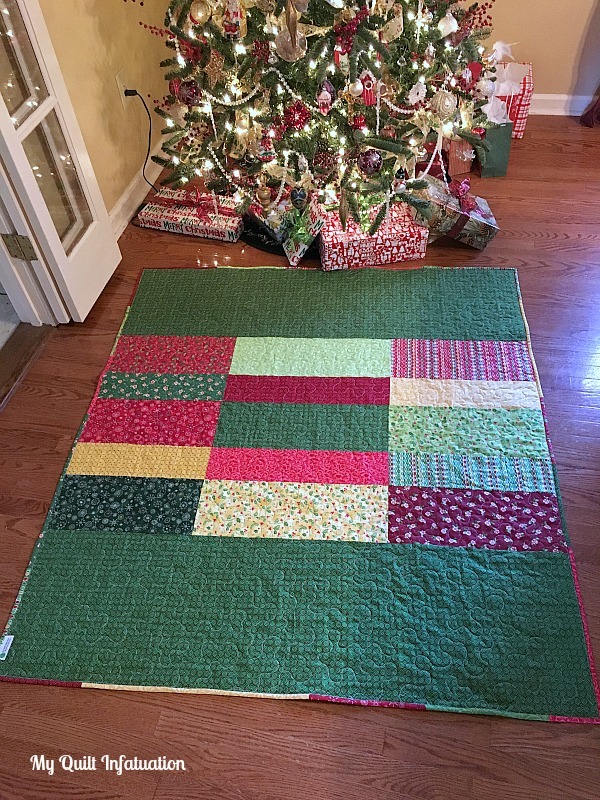 Thanks for the tutorial for a great Christmas quilt. My fave Christmas song is "I'll be Home for Christmas". Reminds me of when DH was in basic training in the Army and made it home for our first Christmas together 45 years ago! A little bit of turning and it would make a wonderful fun tree skirt! Love your quilt. too. 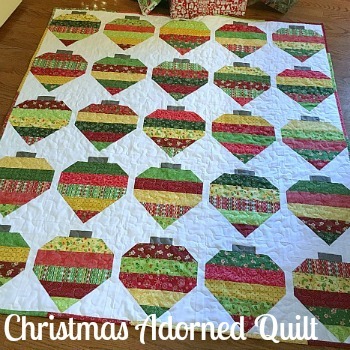 It is so different from any Christmas quilt I have seen before. My favorite Christmas song changes from day to day, but right now I love Silent Night. Wonderful quilt! Thanks for sharing! I now follow both blogs via email!!! And does all Christmas songs are my favorite count?? I really love Rudolph and Grandma got run over by a reindeer!!! 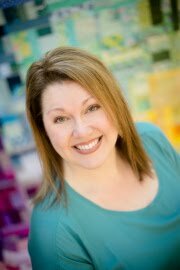 I am a Bloglovin' follower of both Sew In Love With Fabric and your blog, My Quilt Infatuation...love them both! My favorite Christmas song is Handel's Messiah..Alleluia Chorus! my favorite song is russian song " в лесу родилась елочка"
I follow Sew in Love with Fabric via email. Love your gorgeous quilt. It would make a lovely table runner for the holidays. Great job on the quilt. I love all Christmas music, and it is hard to choose just one. Thanks for the opportunity. I am signing up to follow you via email. Love that quilt. I'm following My Quilt Infatuation by email. My favourite Christmas song is Little Drummer Boy. I'm following Sew In Love with Fabric by email. Great quilt. Thank-you for the tutorial. I will make this one. I follow you on BL and Sew in Love by E-mail. I follow sew in love with fabric on bloglovin and gfc. I follow Sew In Love with email. Love the quilt and fabric. I follow Sew In Love via email. 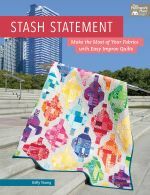 I do follow My Quilt Infatuation by email.Thanks for the tutorial! I do follow you by Bloglovin. Kelly, I'm a Sew in Love with Fabric follower by email and Bloglovin. Kelly I'm now following My Quilt Infatuation by email. OMG the Ornament quilt is stunning! Your tutorial is so fun and thank you for that. I'm cutting a smaller version now...table topper this year. Next season quilt..I love it><. I liked your tutorial so much I signed up to follow you on bloglovin. My favorite Christmas song is O Come Emmanuel. I love O Come all Ye Faithful. Beautiful fabrics shown off wonderfully! I added both to my bloglovin' feed. Favorite song is There's a Song in the Air. Aww your quilt to adorable. I follow you already on bloglovin'. I am following Sew in Love with Fabric on bloglovin' also. Good old Jingle Bells is always the first song that comes to mind, so I guess that is my favourite. Became a follower of Sew In Love. Cute blog spot to check out. Thanks for the link. I also follow My quilt infatuation by email. Love your quilt! I follow Sew in Love with Fabric via email. I love this quilt! Very whimsical! I follow Sew in Love with Fabric on Bloglovin (delliott1000). Thanks! I have two favorite Christmas songs - The carol of the Bells and Oh Holy Night. Thanks! I follow you with on my yahoo account (I think--I know it's by e-mail). I love An Inconvenient Christmas. As well as some more traditional ones. Whoops, I follow you via email, my favorite song is the Hallelujah Chorus by Handel. I follow your blog by email. Santa Claus is Coming to Town. 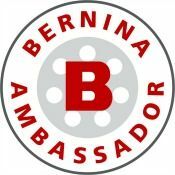 I follow the Bernatex blog by email. Fav Christmas song would be Santa Claus is Coming to Town by Bruce Springsteen. Saw him and Clarence sing it live in 1978! I follow your blog by email. I follow Sew In Love With Fabric via Bloglovin'. Silver Bells is my favorite Christmas song. My sister and I used to sit at the piano and play and sing harmony. She passed away many years ago, but I still miss her dreadfully. But when I hear that song, I know she's singing it with me still. Merry Christmas. 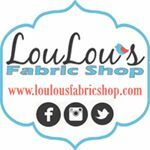 I follow Sew In Love With Fabric's blog. 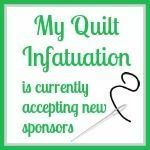 I follow my quilt infatuation through your blog. Carol of the Bells is my favorite Christmas song. With this many comments, you already know what a fantastic quilt you've got. It really is stunning! I follow Sew In Love... On Bloglovin! That is a pin worthy quilt! Thanks for the share. M favorite Christmas Song is... Hmmmm... I love Christmas music... White Christmas is up there, I think that is my favorite (today anyways). Thanks for the giveaway, and Merry Christmas!!! I follow Sew in Love.... by email. I like Good King Wenceslas. I follow Sew In Love . . . with Blogger Dashboard. My favorite Christmas song is generally the one I'm hearing for the first time in the season. But I come down to a tossup among "Mary, Did you Know," "Mary's Boy Child," and, although not strictly a Christmas song, "Bless this House." And I have to say that I just discovered your blog and am now following you on Blogger. Your ornament quilt is gorgeous, and, since it can't hang on the tree, it's perfectly appropriate under the tree, where my cat likes to keep the ornaments anyway. I follow Sew in Love on bloglovin. I follow you on bloglovin. I am not sure about a favorite Christmas song, maybe O Holy Night. Following Sew in Love With Fabric by email. Following My Quilt Infatuation on Bloglovin: Nicole Sender & e-mail. My favorite Christmas song is White Christmas. Oh my goodness, this quilt is ADORABLE! Great pattern Kelly! I'm a follower of Sew in Love via bloglovin. I'm a follower of your blog via bloglovin. One of my favorite holiday carols is Sleigh Ride. and following MQI via email. Love those Christmas projects! Really like the design. Thank you for the link to the directions.